Private Holiday Homes Denmark arrange the letting of private holiday homes and rental of private holiday homes through local agencies throughout Denmark. We specialize in providing private holiday homes and dissemination of private holiday rentals through small and medium sized agencies with great personal knowledge of the individual holiday homes and the holiday home areas. 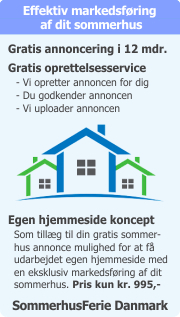 We advertise good and cheap holiday homes for rent all over Denmark directly from the advertiser to you as a tenant. We offer a large variety in holiday homes. Are you considering to rent a holiday home for your next holiday, you will find plenty of holiday homes where both quality and price are good and suitable for every need and budget. Private Holiday Homes Denmark offers a professional solution for holiday home advertisers, who want to rent out their holiday homes easily, simply and cost-effectively without having to pay a large portion of the rental income in marketing costs. We offer advertisers of holiday homes an effective marketing package in the form of targeted advertising and positioning on the Internet and the possibility of acquisition of own website concept for a very competitive price.